The SQL Derived Table is nothing but a Subquery used in the From Clause. 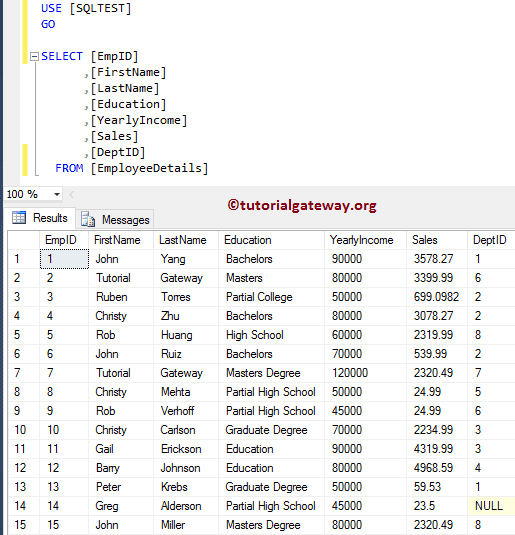 In this article, we will show you, How to write Derived Table in SQL Server with practical examples. 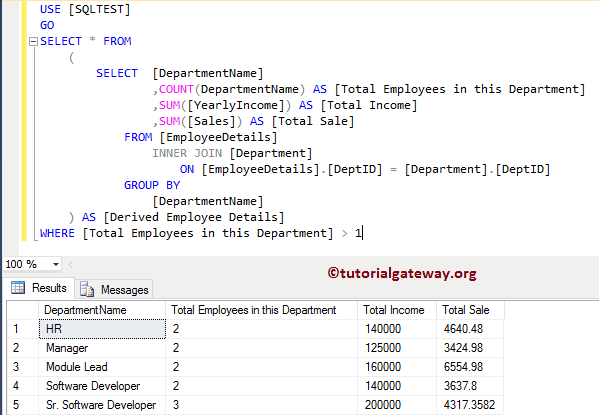 For this Sql Server derived table example, We are going to use two tables (Employee Details and Department) present in our [SQL Test] Database. 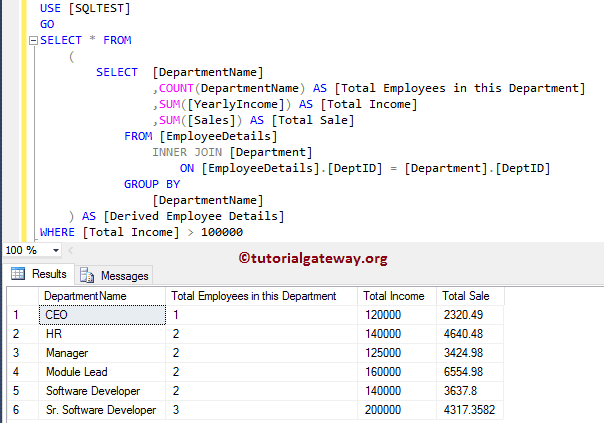 This is the simple example to demonstrate the SQL Server derived table. 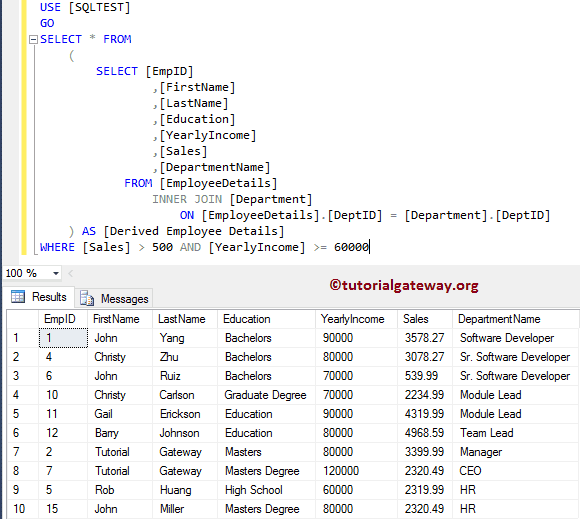 Following SQL Query will display all the columns present in Employees table whose sales amount is greater than 500. First SELECT * statement is deriving columns from the inner select statement. In this example, we will use Joins concept inside the Derived Tables. 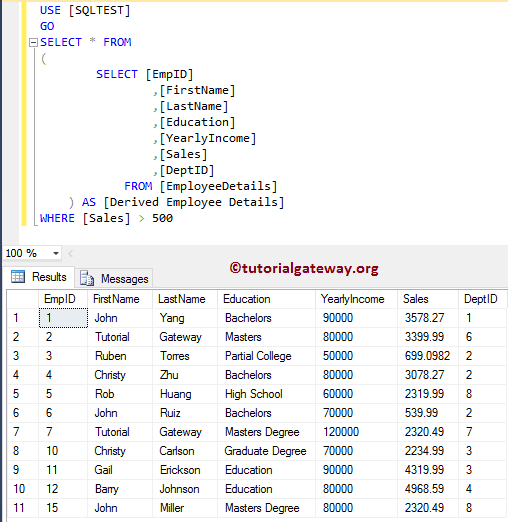 The following SQL Query will display all the matching columns present in Employees and Department tables whose sales amount is greater than 500, and yearly income is greater than or equal to 60000. For this demonstration, we are using the INNER JOIN. The following Query will display count the total number of employees present in each department, their sales amount, and their total annual salaries. 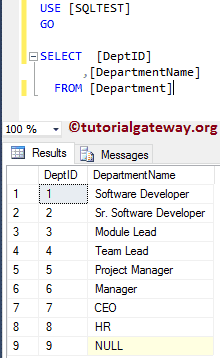 For this Sql server Derived Table example, we are using Inner Join to get a column from both Employees and Department tables. Next, we used GROUP BY Clause to aggregate the columns. Please refer Aggregate Functions article to understand these functions. Here we are just adding WHERE Clause to restrict the Employees. The following SQL Query will display Department names whose employees count is greater than 1. 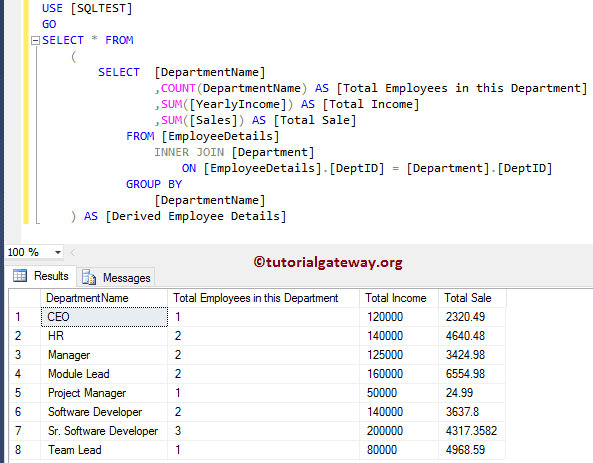 The following SQL Server Derived table Query will display Department names whose employees Total Income is greater than 100000.